﻿ Real Madrid 1-1 Barcelona. Raphael Varane rises to the occasion! 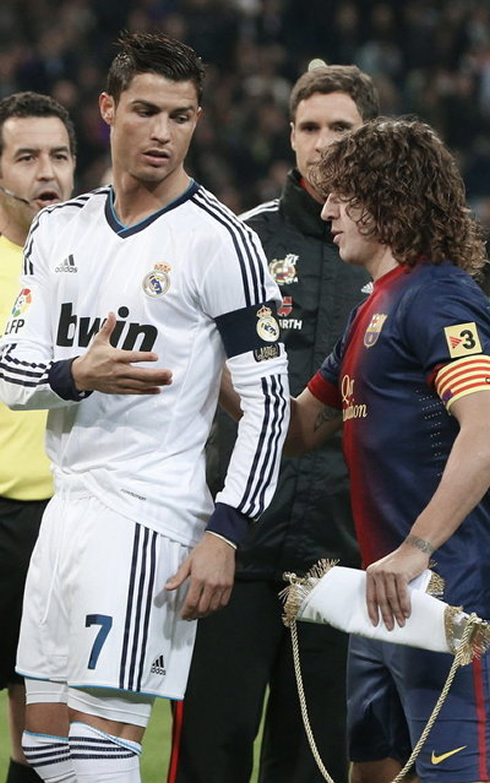 30.01.2013 » Real Madrid 1-1 Barcelona. Raphael Varane rises to the occasion! The World had their eyes turned to Lionel Messi and Cristiano Ronaldo this Wednesday night, but it was Raphael Varane who stole the show in an emphatic way. Real Madrid and Barcelona tied 1-1 at the Santiago Bernabéu, with Cesc Fàbregas scoring for the visitors shortly after the break and Varane getting the equaliser, 10 minutes before the final whistle. 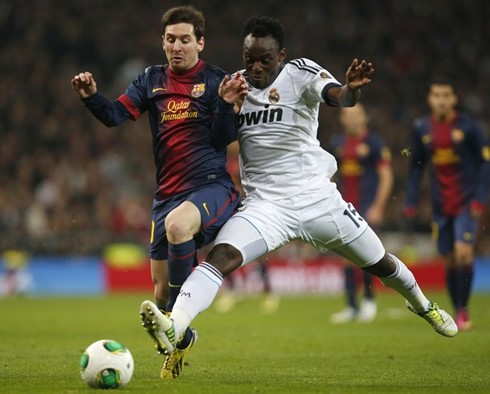 Both teams will face again in the second leg at the Camp Nou, on February 27. Real Madrid and Barcelona tied 1-1 tonight, in a thrilling and very entertaining match at the Santiago Bernabéu, for the Copa del Rey first leg. The victory in this game could have easily gone to either team, but it seems as if both sides' defenses ended up dominating the action and prevailed over the attacks. 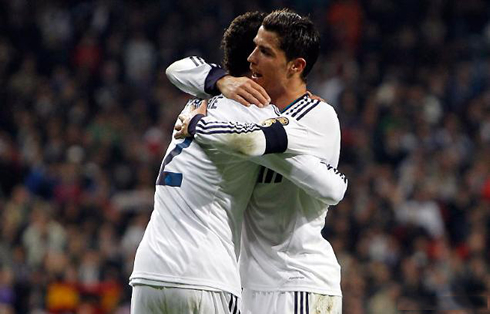 Neither Ronaldo nor Messi found the back of the net, despite the numerous and uncessful attempts throughout the game. Fàbregas gave the lead to the Blaugrana with only 5 minutes played in the second half, but Real Madrid's 19-years old center defender, Rapahel Varane, equalised the "Clasico" from a powerful header inside the box, allowing the Merengues to keep dreaming with a ticket for the Copa del Rey final. 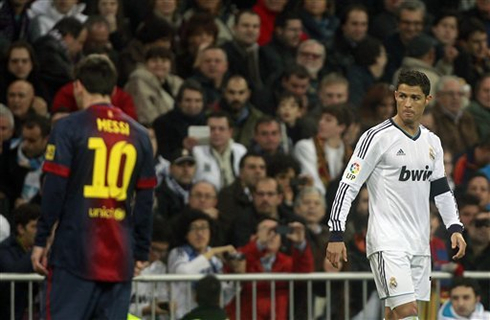 The Barcelona vs Real Madrid second leg will be held in the Camp Nou, on January 27. We were in for a treat at the Bernabéu and everyone was aware of that. The two undisputed best teams in the World were about to clash for the first time in 2013, in a "Clasico" that promised to have tons of controversy, goals and breath taking moments. Were our expectations defrauded since this Wednesday's game only presented us with two goals? Surely not! Both Real Madrid and Barcelona went ahead chasing the win, playing the game in such an intensity that a good part of the viewers probably had to ask for a break, way before the half-time and final whistle came on. Real Madrid was heavily conditioned as they couldn't count with several key players in their back line. The likes of Pepe, Marcelo and Casillas were still recovering from injuries, while Fábio Coentrão and Sergio Ramos were suspended for this game. That's 5 players sidelined, who in normal conditions should easily get more than 30 games apperances per season. To make it even worse, Angel Di María was also suspended and unavailable for this match. Mourinho scratched his head quite a few times over the past days and went forward with a couple surprises in the line-up, bringing on Diego Lopéz for Adán's place, switching Arbeloa to left-back and Essien to the right, and also sent in Callejón into one of the wings, for an attacking partnership with Cristiano Ronaldo and Karim Benzema. He also picked Varane and Ricardo Carvalho over any pair with Raúl Albiol and it sure paid off, as Varane showed off his defensive skills with numerous world-class tackles and still found time to score the equaliser from a great and powerful header, after meeting a cross made by Mesut Ozil. As for Barcelona, no significant surprises in the way they approached this game, probably thanks to their fortune when it comes to injuries or having players suspended... Jordi Alba and Daniel Alves took the wings on the back, while Piqué and Puyol closed the gates in the center. Busquets, Xavi and Fàbregas held most of the action over the midfield, with the typical Blaugrana's dynamism provided by Andrés Iniesta, Lionel Messi and Pedrito more upfront. Half-time arrived and the goalless draw stubbornly threatned to keep dragging through the second half. 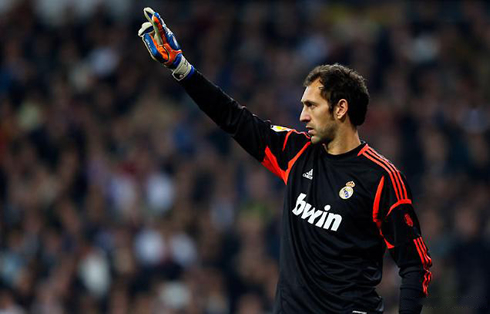 However, that feeling wouldn't last too long after the game kicked off for the second period, since Barcelona took the lead near the 50th minute, after an insistence Blagruana play where Messi ended up assisting Fàbregas for a 1-on-1 situation against Real Madrid's debutant goalkeeper, Diego López. The former Arsenal's midfielder didn't waste the chance and made the ball get past Diego López without much trouble, putting Barcelona ahead in the game and with a precious advantage on the semi-final series. The game became even more open after Barcelona's goal and both sides had at their disposal several great chances to hit the back of the net for the second time on the night. Diego López, Varane and Essien performed at a very high level in Real Madrid's back line and mostly thanks to them, Barça never managed to seal the deal with that second goal. 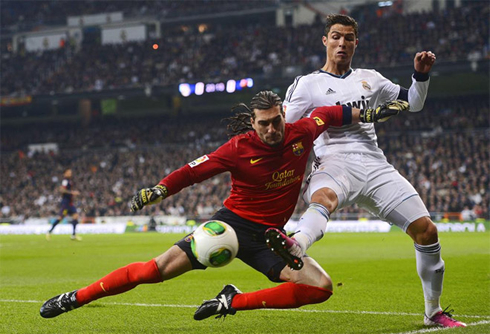 The Merengues also got plenty of chances to beat Pinto before entering the last quarter of the game, but Barcelona's defence has always been very focused in their tasks and delayed the upset as much as they could, with a few impressive last-second sliding tackles. 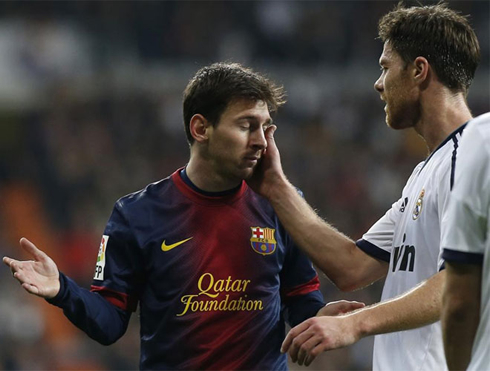 What Barcelona players certainly didn't count with was to concede a goal from a header by a Real Madrid defender. With 80 minutes on the clock and following the rebound of a corner kick, Mesut Ozil retrieved the ball still close to the sideline, spotted a big amount of players still inside Barcelona's penalty area and dropped in a perfect cross. Real Madrid's 19-years old defender, Raphael Varane, who was one of the tallest players on the pitch last night, anticipated Gerard Piqué and Fàbregas and headed it with conviction into the back of the net. The Bernabéu exploded in joy as the Merengues had just scored what could very well turn out to be a vital goal in deciding who goes through in this semi-finals series. Cristiano Ronaldo and Lionel Messi may not have scored as they were expected to, but this game's dynamism and intensity has surely made it worth for any football fan to watch it closely from its beggining to the end. 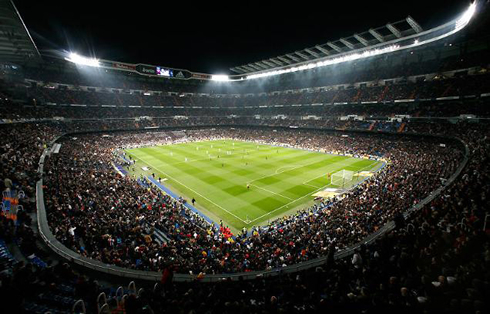 If there are no rescheduling issues, Barcelona and Real Madrid will face each other again for the Copa del Rey second leg on February 27, this time at the Blaugrana's homeground, in the Camp Nou stadium. A few days later after that game, there's another "Clasico" for La Liga (March 2), and then the UEFA Champions League 2nd leg tie between Manchester United and Real Madrid, on March 5. What a week in prospect for any football enthusiast to have ahead! 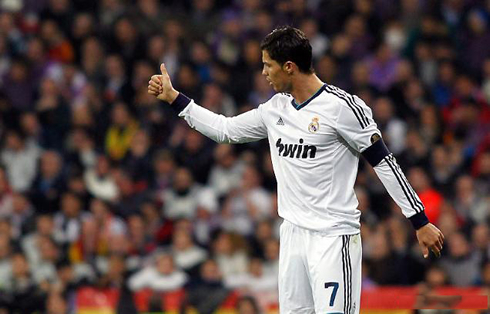 Cristiano Ronaldo next game for Real Madrid will be against Granada, for the Spanish League "La Liga", on February 2, 2013. You can watch Juventus live stream, Granada vs Real Madrid, Valencia vs Barcelona, Fulham vs Manchester United and Arsenal vs Stoke City, all matches provided from our soccer live section.